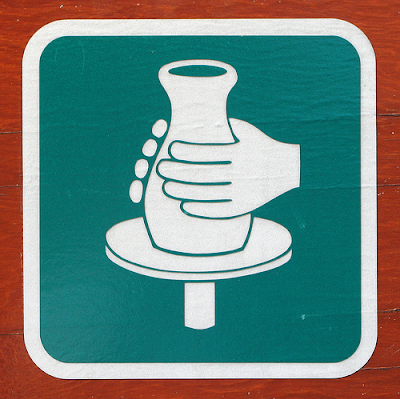 our generation has been misinformed about pottery. can i just say that there is nothing romantic about pottery? me + clay? not so tight. i took a pottery class in high school. my projects weren't graded too hard, so i kinda liked it. i'm sure you're fabulous at it! you're good at everything you do! I feel ya. lee and I took that class last summer, and Lee was good, i sucked. And i laughed when i first saw that sign "no dates" but then after a few classes, we saw people who attempted to do it. dummies. Glad I wasn't planning on making any pottery...ever. What, when are in class you DON'T have the music to Unchained Melody playing in the background and your teacher ISN'T a Patrick Swayze look alike? Probably not worth an audit then, I guess.